VeriBlot for IP Detection Reagents are immunoblotting reagents that enable the trouble-free detection of immunoblotted target protein bands, without interference from denatured IgG. This allows to detect the (co-)immunoprecipitated protein without masking by the IgG heavy (50 kDa) and light chains (25 kDa). In general, this interference tends to originate from secondary antibodies which recognize primary antibodies released with the antigen during the immunoprecipitation procedure or endogenous IgGs from the lysate itself. VeriBlot for IP detection reagents only recognize native (non-reduced) antibodies and therefore the detection of heavy and light chains is highly minimized, if the immunoprecipitate is fully reduced. At least 20 (based on a 1:200 dilution in 5 ml milk). 2. The VeriBlot for IP Detection Reagent (HRP) preferentially detects the non-reduced form over the reduced, SDS-denatured forms. 3. IP sample should be completely reduced/denatured before loaded onto a western blot. Boil samples for 5-10 minutes in SDS sample buffer with a increase in SDS amount if required. 4. Milk should be used as the blocking protein for the immunoblot. Our Abpromise guarantee covers the use of ab131366 in the following tested applications. The dilution will depend on the sensitivity of the HRP substrate. The dilution range recommended is 1:40 - 1:4000. Based on a 1:200 dilution (25 µL) in 5 ml milk researchers can perform 20 western blots. This product is recommended for the western blot detection of IP samples. Make sure the lysates are reduced and denatured completely. Immunoprecipitation - VeriBlot for IP Detection Reagent (HRP) (ab131366)This image is courtesy of an anonymous Abreview. ab128874 Immunoprecipitating Brd4 in human HEK293 whole cell lysate. 1000µg of cell lysate was incubated with primary antibody (1µg/mg in 50 mM Tris) and matrix (Protein G) for 16 hours at 4°C. For western blotting a HRP-conjugated Veriblot for IP Detection Reagent (ab131366) (1/10000) was used to confirm successful immunoprecipation. Immunoprecipitation - VeriBlot for IP Detection Reagent (HRP) (ab131366)This image is courtesy of an Abreview submitted by Christian Marx. ab32371 immunoprecipitating Bak in human HCT116 p53-/- whole cell lysate. 100µg of cell lysate was incubated with primary antibody (1/100) and matrix (Protein A/G) for 4 hours at 4°C. For western blotting a HRP-conjugated Veriblot for IP Detection Reagent (ab131366) (1/2000) was used to confirm successful immunoprecipation. ab6148 Immunoprecipitating IRAK2 in human HEK293 whole cell lysate. 1000µg of cell lysate was incubated with primary antibody (1 µg/mg) and matrix (Protein G) for 16 hours at 4°C. For western blotting a HRP-conjugated Veriblot for IP Detection Reagent (ab131366) (1/10000) was used to confirm successful immunoprecipation. ab124962 (purified) at 1/20 immunoprecipitating IL-1RA in NIH/3T3 whole cell lysate. Lane 2 (+): ab124962 + NIH/3T3 whole cell lysate. Lane 3 (-): Rabbit monoclonal IgG (ab172730) instead of ab124962 in NIH/3T3 whole cell lysate. 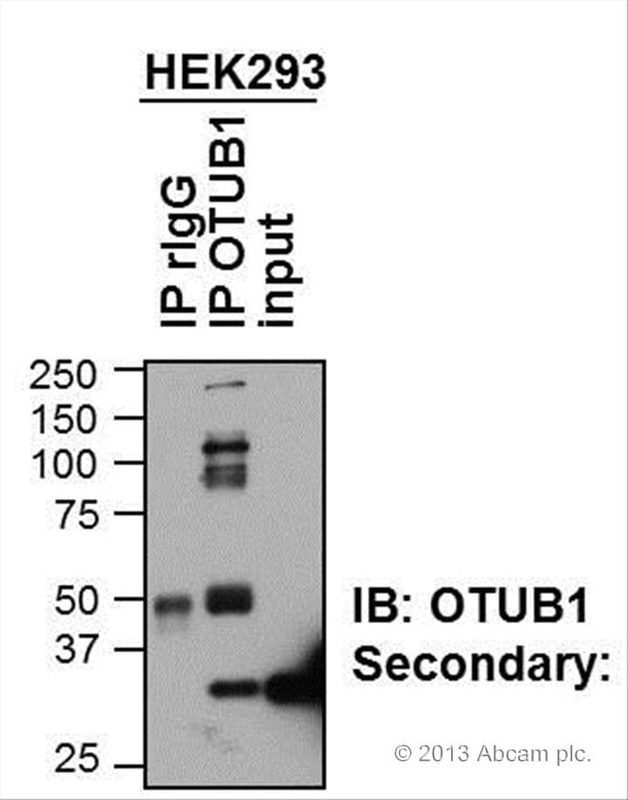 For western blotting, ab131366 VeriBlot for IP (HRP) was used as the secondary antibody (1/10000). ab108338 (purified) at 1/20 dilution (2µg) immunoprecipitating ATG9A in HEK-293 (Human embryonic kidney epithelial cell) whole cell lysate. 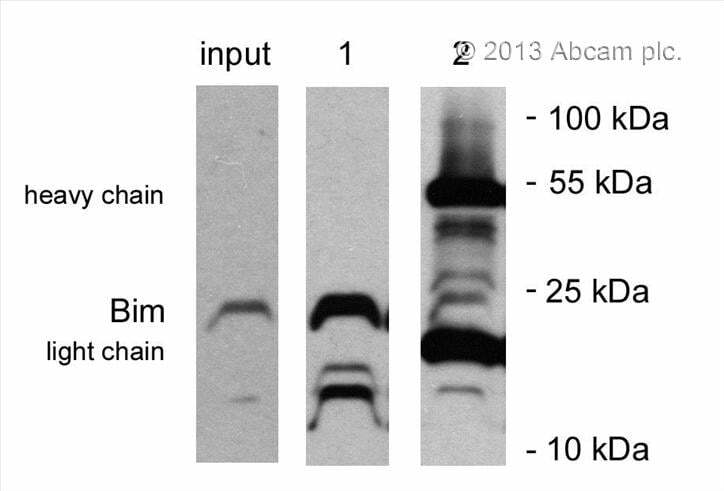 Western blot conditions: 10µl of each sample was separated on a SDS PAGE gel, transferred to a nitrocellulose membrane, blocked with 5% BSA and probed with ab9045. Detection: VeriBlot for IP Detection Reagent (HRP) (ab131366) at 1/1000 dilution. Publishing research using ab131366? Please let us know so that we can cite the reference in this datasheet. 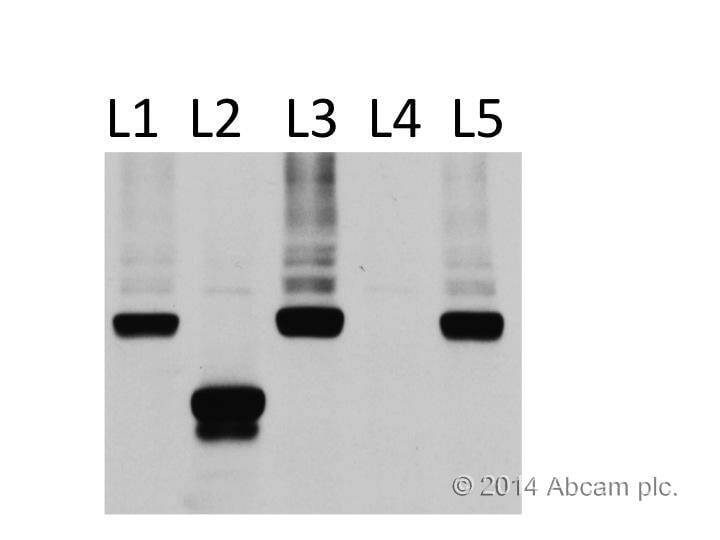 The IP was done with Rabbit antibody and afterwards WB was also done with rabbit antibody. can't see the light and heavy chains of the IPed antibody. Q1: Why I see band of approximately same size as of heavy chain? Q2: Why there are non-specific bands on the gel? Q3: Why mouse IgG1 is not listed in specificty table? A1: To eliminate this the samples should be denatured and reduced completely. The Veriblot antibodies does not bind reduced IgGs so please make sure the samples are boiled for 5-10 minutes at 100C and the SDS is of high quality. If required amount of SDS can be increased in the samples buffer. A2: Nonspecific bands are typically due to excess HRP in the system, or excess of primary antibody. SDS may also cause proteins to bind non-specifically as surfaces that normally would not be exposed are opened up with the linearization of the protein, which can result in protein: protein interactions that would not occur in the native state. Running a native or non-denaturing gel, should eliminate this problem with SDS. Addition of 0.05% non-ionic detergent such as Tween 20 or Triton X-100 in the blocking and washing solution is highly recommended. Proper multiple washings of membrane are recommended. A3: The affinity with mouse IgG1 isotype is low as compared to other listed Isotype so we are unable to guarantee it. It may work, but has to be tested empirically on a case by case basis. Mitochondria were isolated from HEK293 cells and 200µg extract was used per IP. 1µg ATP synthase beta (ab14730) was crosslinked to a mixture of Protein A and G beads (left panel on figure) or not crosslinked (right panel on figure). GAL4 was used as a negative control. The extract was incubated with the beads and antibodies overnight at 4C in 100mM Tris, pH 7.6, 20% glycerol and inhibitors. In the morning the beads were washed 3 times and eluted with 1M glycine, pH 2. The samples were run on 12% gels at 180V for 1h, semidry transferred on a nitrocellulose membrane for 30min at 25V and blocked in 5% milk for 30min at room temperature. The membranes were incubated with 1:1000 dilution of ATP synthase alpha (ab14748) and ATP synthase beta (ab14730) antibodies in BSA overnight at 4C. In the morning the membranes were washed 3 times for 10 min in TBST and incubated with secondary antibody for 1h in 5% milk for the membrane with the crosslinked beads or with Veriblot (ab131366) for the non-crosslinked samples. After another 3 washes for 10min in TBST the signal was detected using ECL detection reagent. is https://www.abcam.com/veriblot-for-ip-secondary-antibody-hrp-ab131366.html the right one is it an antimouse? or do you have 2nd antibodies HRP that I can use to avoid detecting Heavy or light chain or both. 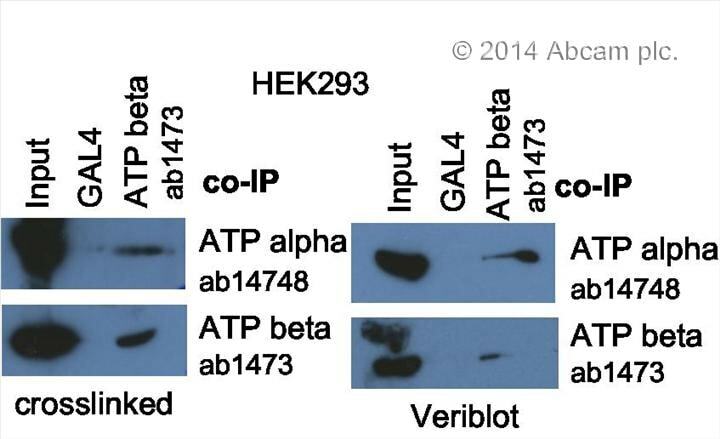 If your mouse primary antibody is IgG1, then you can detect it with ab131368. I hope this helps. Please let me know if you have any further questions. Western blot using the antibody with cell lysate prepared from S. cerevisiae. Myc tagged protein probed with a Myc polyclonal antibody and a secondary Rabbit IP specific antibody after Immunoprecipitation. Lane 2 has a smaller Myc tagged protein and Lane 4 is IP control with no Myc tagged protein. The antibody recognizes the right protein with very little background (see image). I highly recommend this antibody. An IP was performed using ab175200, the sample was denatured in SDS sample buffer and boiled for 5 min. The sample was then run under denaturing conditions on a 10% gel. AB131366 was used as secondary antibody: 25ul in 5ml 5%-milk-TBST for 30 min at room temperature. No light chain was detected (~25kDa), a bit of heaychain (~50kDa) is still picked up by this antibody. IRAK2 was immunoprecipitated from HEK293 cells (1 mg), run on an 8% gel and western blotted with the same antibody. The rabbit secondary was used at a dilution of 1/10000 before detection by the ECL method. We performed an IP against Bim from HCT116 cell lysate. As the protein size of Bim is around 25 kDa, we first tested the VeriBlot secondary antibody (ab131366) to analyse its binding (lane 1). No signal from the IgG heavy and light chain, even after long exposure times, was observed when using ab131366. Next we developed the same membrane with a standard secondary antibody (ab97051) as a comparison (lane 2). The signal was much stronger with the standard secondary antibody but the strong signals of heavy and light chain of IgG overlayed the signal of Bim. To sum up, the VeriBlot secondary antibody is a nice tool to analyse proteins at around 25 or 55 kDa in IPs. Lane 1 shows Bim long and short forms, after a exposure time of 5 min with ECL+. The secondary antibody (ab131366) was diluted 1:2000. Lane 2 shows Bim overlayed by the light chain of IgG after a exposure time of 2 min with ECL. The secondary antibody (ab97051) was diluted 1:10000. If you have a secondary antibody against rabbit or goat that works (is not detecting denatured IgG from the IP pulldown) then we would be glad to have that. We are facing huge problems detecting 25 kd proteins from IP samples. If not we would like the credit. Thank you for your reply. Our Veriblot range really is the only line that we have that have been tested to provide the results you're looking for, so I will just issue you a credit for this purchase. Hi Abcam. 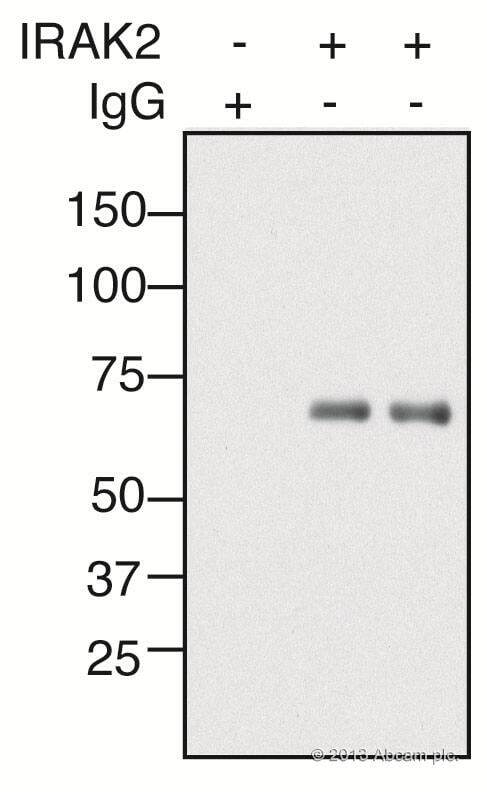 We also tried the antibody on non IP samples, There was no problem with background from 50 kd and 25 kd bands. The samples are cell lysates and contains no IgG. The expected MW of our protein of interest is 25-29 kd and therefore it's a problem with the background from the light chain. Thank you for your reply and confirming these details. I am happy to offer a replacement or credit. Please let me know which you would prefer. I look forward to your reply so that I may assist you further.